Slugs and snails can be extremely vexing to a hosta enthusiast. They need not be if you follow some simple rules. Want to know more about how to deter these garden pests? Read Richard's article below. First, be preemptive! Once the nighttime temperatures are in the 50*F to 60*F range, you should start baiting for them. DO NOT wait until you see the first signs of damage. Second, use the organic bait that is safe for the environment, children and pets. Sluggo is an organic slug and snail bait made from iron and phosphorous. The bait is activated by moisture just as slugs and snails are. As the Sluggo gradually breaks down in your garden (after having killed the snails and slugs present), it releases iron and phosphorous into your soil. Two essential nutrients for plant growth. If you only have time to use one method of control, I suggest the Sluggo. If you have more time, you can use Sluggo in conjunction with baiting with beer. A shallow cup buried at ground level and filled with beer to within an inch of the top is effective but time consuming. I like it because you can monitor the infestation by the number of snails and slugs captured. Another way to monitor your infestation is to place a piece of wood in your garden and look underneath it every day to see how many slugs are hiding there. When they eat Sluggo, they stop eating and go off to hide under a rock until they die. Follow the directions on the container, and remember that slugs and snails need moisture to travel. What this means is during rainy periods they are able to relocate to - and feed more easily on - your hosta plantings. Rainy periods are when they can do the most damage and create more offspring. 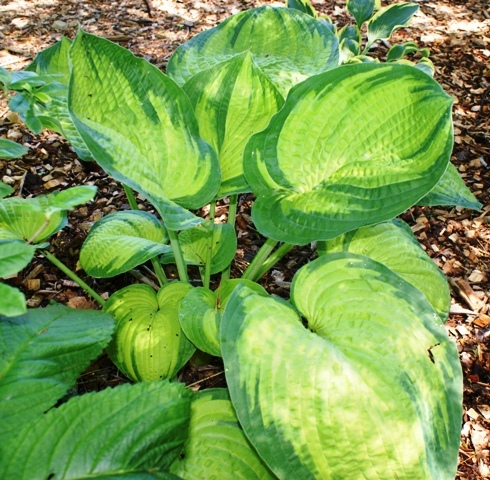 If you choose to, you can grow more of the slug resistant hostas.These are listed under their own category on the left side of the home page. 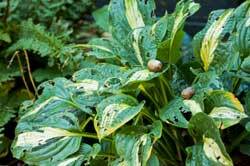 These hosta selections have thicker and tougher leaves that the slugs and snails cannot feed on easily. Don't limit yourself to these selections as there are more and more exciting new hostas available every year. Follow the few simple suggestions stated earlier and you can enjoy any hosta you care to grow in your garden. Note: Sluggo Plus Spinosad is Sluggo with the additional ingredient Spinosad that kills sowbugs, pillbugs and earwigs. This is also environmentally safe to use in your garden. It is not long lasting and ultimately breaks down into harmless carbon, hydrogen, oxygen and nitrogen.